Tap Settings on the Home screen. 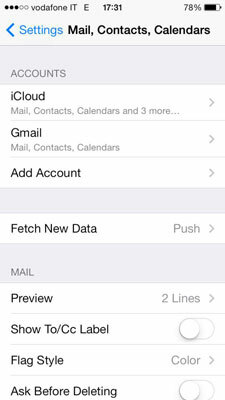 If you already set up an account for mail or contacts, tap the name of the account in the list and then tap the Calendar switch On. Tap the service you use: Exchange, Google, Yahoo!, or Outlook.com. The Add Account screen opens. Tap the Next button in the upper right corner. After your account is verified, a screen opens showing a list of available services. Tap the Calendars switch On. Swipe back to the first Mail, Contacts, Calendars settings screen and you now see the added account in the Accounts list and the activated services appear under each account name. If you want to use iCloud with your Windows PC, download the iCloud Control Panel for Windows app from Apple. You have to sign in on your iPhone with the same account information you use on your computer to have the same information in both places.